To the east of the state of Saxony sits the lake-filled Bautzen District. 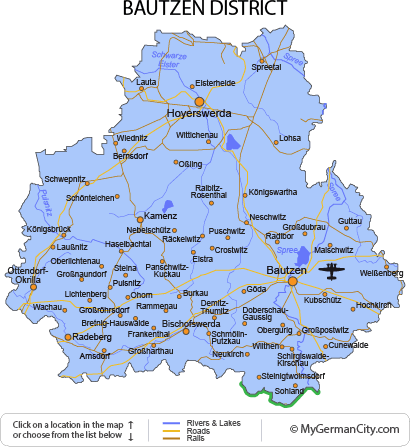 Stretching the width of the state, it borders on the Czech Republic in the south and Brandenburg to the north. It also touches the historic Gothic city of Dresden to the west. The city of Bautzen, on the Spree, is the regions capital today and is over 1,000 years old. It is so breath-takingly beautiful that it has been “twinned” with both Worms and Heidelberg! Bautzen has some fantastic architecture for you to explore, and the horizon is dotted with great towers and elegant spires. However, its history (and that of the whole district) is not all German — it once belonged to the great Kingdom of Bohemia. This territory belonged to the indigenous Sorbs (the Slavic Wends) and they even have their own language. As a result, many towns here are bi-lingual and celebrate Sorbian festivities. The south-west of the Bautzen District touches Saxon Switzerland, so called because of its perfect scenery and pretty villages. Obviously, this region is famous for its attractive landscape and is a magnet for outdoor enthusiasts. However, the village of Pulsnitz is most famous for its Pfefferkuchen — a type of soft gingerbread made for Christmas.